The Thornton Burgess Room is located in the Carriage House, just steps away from the Main House. It features a king-size bed, a full-size sleep sofa for up to two extra guests, a gas fireplace, and a spacious bathroom with oversize whirlpool tub and separate shower. 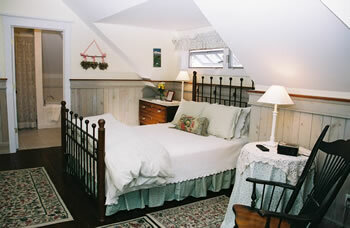 Overlooking the garden and fish pond, this room is a peaceful retreat for a romantic respite or a quiet family getaway.